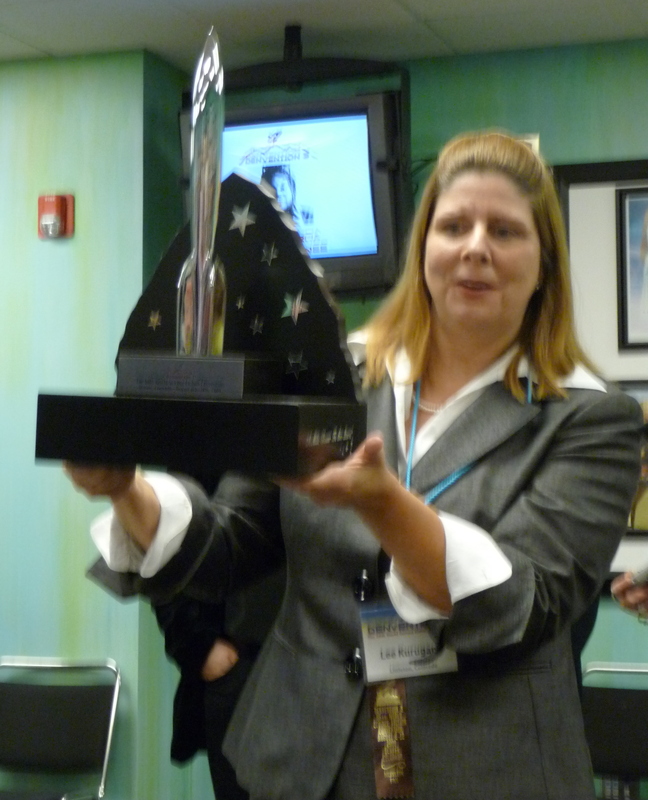 Artist Lee Kuruganti debuted her Hugo base for during the pre-Hugo reception at Denvention 3. I enjoyed this blogger’s take on Denvention 3. Here’s an excellent photo by Diana of Laurie Mann, Gay Ellen Dennett and Mary Kay Kare, shot during the pre-Hugo reception on Saturday night at Denvention 3. 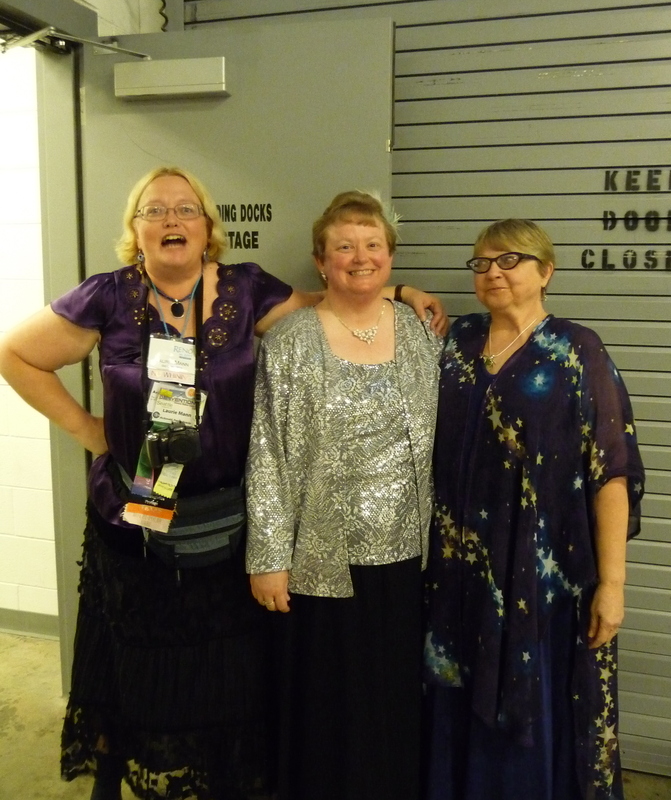 Mary Kay was the Hugo Administrator, and Laurie and Gay Ellen’s responsibilities included running the Hugo Ceremony. Diana captured some great moments at Denvention 3, like this one of Connie Willis, Mark Olson (accepting for Jeff Prucher), me, and John Scalzi. I’ll add a few more here tomorrow, and run the others in the next issue of the fanzine. Tonight’s “Former Worldcon Chair Party” was a blast for all the usual reasons, as I went around comparing notes on Denvention, asking people’s plans for the next couple of Worldcons, and seeing a few people for the first time who’ve been on site for days (Kevin Standlee, for one example.) The food and wine was good, but I’d say the cold bottled water probably went as fast as anything — so much for the legend of hard-drinking smofs. A great treat for me was meeting for the first time Erle Korshak, not just a well known fan, but one of the very few surviving members of the first Worldcon in 1939. (Two of the several others are LA locals Forry Ackerman and Ray Bradbury.) Erle filled me in on the revival of his historic Shasta Press, as Shasta/Phoenix. Shasta was a famous publisher of hardcover sf decades ago. I’ll be watching for new developments there. Update 8/12/2008: Corrected spelling of name. Mary Robinette Kowal’s winning the Campbell Award was a real audience pleaser, one of the most loudly cheered events of the night. Adding interest, she not only received the award plaque, she received the “Campbell Award Tiara,” an elegant piece of jewelry that went well with her yellow gown. A more esoteric audience pleaser, that fans approved once it was pointed out to them, was the selection as the sample clip from Heroes of the scene where LASFS member Tadao Tomomatsu in his role as a detective questions one of the series’ regular characters. Outstanding! Update 8/10/2008: Made change reflecting David Levine’s correction. My deepest thanks go out to everybody who supported File 770 for the Best Fanzine Hugo. It’s very much an honor to win, and a pleasure to know fans like what they’re reading in the zine and here online. And it was great to experience that moment together with my wife, Diana. I’d have loved for her book to win, too, but we have been very happy to hear from people here at Denvention who came up to tell her how much they enjoyed it. 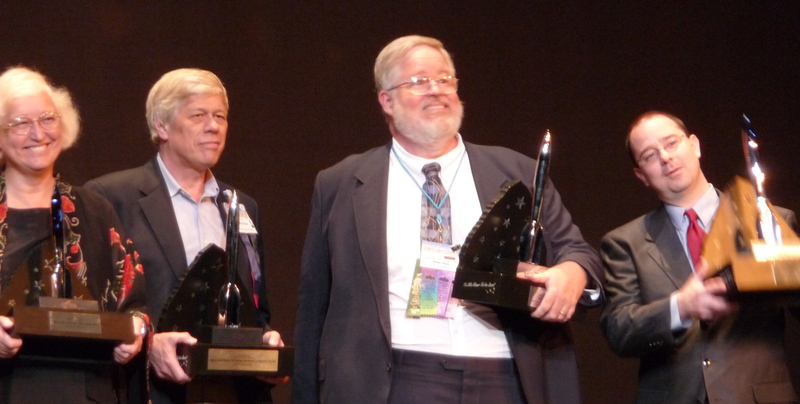 Worldcon coverage on the Internet – Eureka! Fast Forward: Contemporary Science Fiction has posted a several-minutes-long video blog about Denvention Day 1. It’s rather good, too, mixing brief interviews with various fans (among them, Michael Walsh and Phil Foglio), shots of a Registration line already made notorious by Cheryl Morgan, and excerpts from Opening Ceremonies and a Rick Sternbach program item. The small-format video came through with jewel-like clarity on my computer. Highly recommended. I don’t really have all this time on my hands. There’s lots I need to do before I fly off to Denvention. Like pack my suitcase full of something that’s worth the $15 those pirates at United Airlines are going to charge me for checking a bag. Help Sierra pack up stuff for her overnight stay with a friend’s family. A whole list. So naturally I chose this moment to load Google Earth. I scanned the route between my hotel and the Colorado Convention Center. Then before shutting down I checked out my home address. Turns out they have a new satellite image of our neighborhood. Unfortunately, it was taken when my car wasn’t at home. So if you’d like to see the big oil stain in my driveway, tell Google Earth to look up Latitude 34° 9’14.25″N, Longitude 117°59’25.99″W. I asked Denvention 3 Hugo Administrator Mary Kay Kare if the media (hey, faneds are media!) would again receive an embargoed list of winners, as was done with the nominees? My personal opinion is that’s exactly the right way for Denvention 3 to handle its business. It’s fine that the winners’ names will be all over the Net two seconds after each Hugo is presented (assuming people in the audience can make their technology to work.) And I feel more comfortable when there is no potential for the winners to be accidentally revealed in advance, as happened with the nominees.